Funny how these “latest work” updates seldom update because you’re too busy working! Batman turns 80 this year— jeez. In honor of this event DC Comics is doing approximately four million alternate covers for the historic issue. Here’s mine, you’ll be able to buy it right here if you want one next week. Bat-Man’s first ever appearance inside comic books, well sorta. 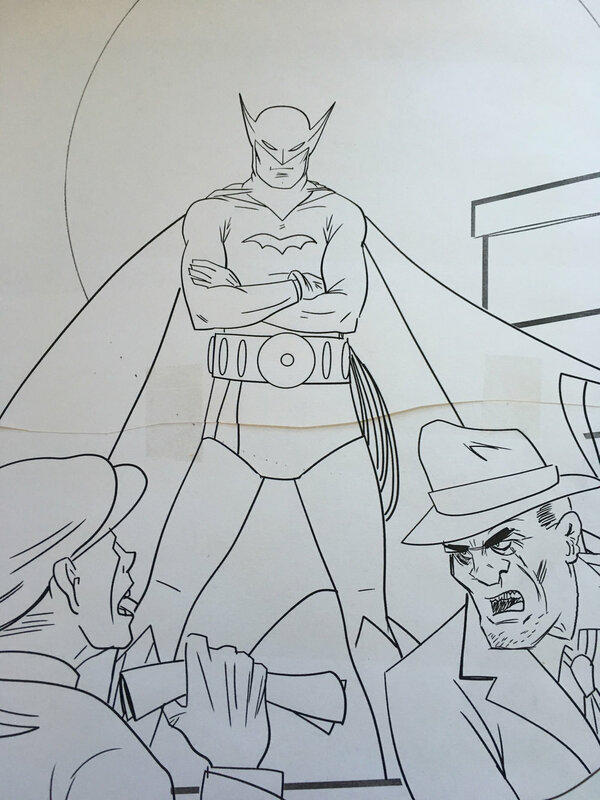 I decided to base my cover design on the very first appearance of Batman, or The Bat-Man as he was called back in May of 1939. In the pages of Detective Comics #27— so after his cover appearance and a brief headshot in Detective Comics #26 this is the first time we ever see Bob Kane and Bill Finger’s creation in action. There is considerable debate among those of us who also argue things like “Can Underdog beat The Incredible Hulk?” and “Could Superman actually change the course of time by spinning the world backwards?” as to whether or not Batman’s tiny gloves in this first appearance are purple or blue. I know what you’re saying— well there they are— they’re blue! Not so fast. In other printings they’re purple. That’s going to matter later. Using what Kane or whoever helped him draw the original piece did, I figured on this pretty straightforward shot. Now the only thing I don’t like about this is I’m going to be the only one to get that I’m going for the original appearance because we can’t see the two hoods Batman kills in this first sequence. Now you may notice for this one I used almost identical styles and looks for the two hoods as Kane had originally done. I kind of liked their grotesque and crude nature. But as I started inking this one they’re ugliness and stiffness just didn’t work for me. I also wasn’t too happy with Bats pose— he’s a little too “hey fellas” in the head tilt. So that took me to this one, I completely redrew everything— now the hoods are a little more stylized and Batman is coming for them. I like this, but now it’s a “moment after” that first appearance. Because in the Det 27 shot he’s just standing there. So it’s back to the drawing board again. I added the tenements in the background even though in the scene they’ve just left a wealthy dude’s house— I figure everything in Gotham is tenement level living— from here I’ll go on to color and some final tweaks, but this is about 90% of the way done. 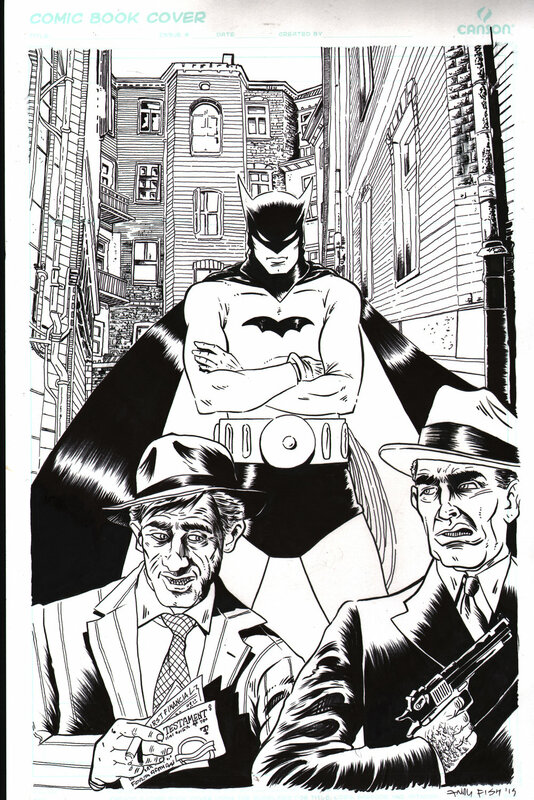 The finished piece will be available as a variant cover for Detective Comics #1000 and as a Limited Edition Print available right here and at fine retailers near you. 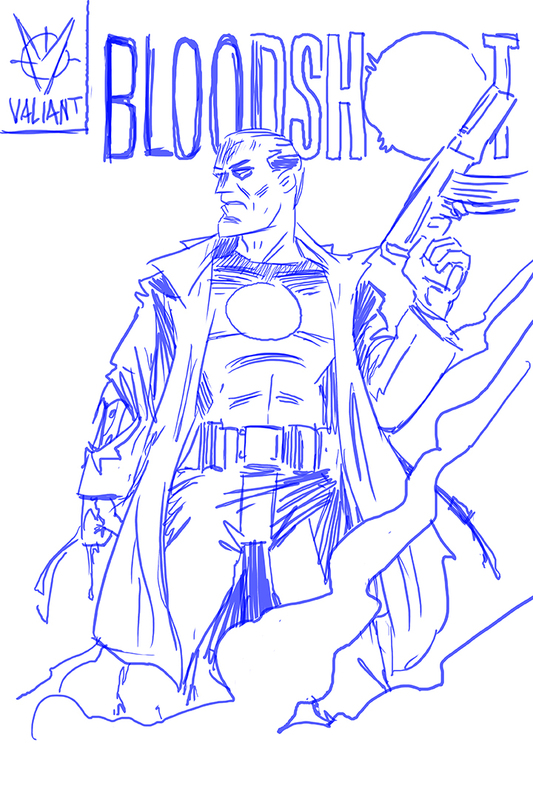 BLOODSHOT VARIANTS for Valiant Comics. Option 1 - I wanted to play with some lighting on this one and create a very dramatic composition by having the smoke/fog rising up at his feet. Option 2- Sort of the same theme but this time with a handgun and the loss of his jacket. 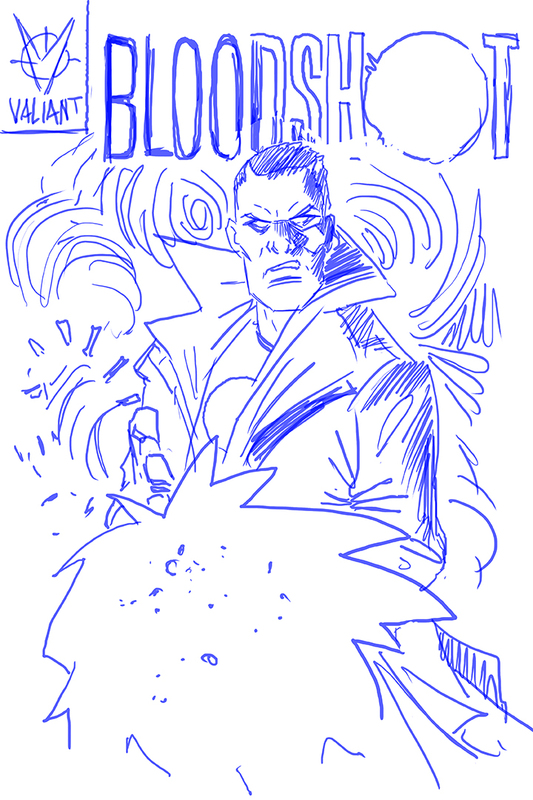 Option 3- More of an action cover. Option 4- More of an action/pulp type cover- I returned the long jacket and I thought we could play with the light coming from the muzzle fire as well as give it some dramatic lighting. This is the version they asked us to finish, and it should be out very soon. Check Valiant’s social media. New Slipcover for GEEKS & GREEKS— available at fine book sellers everywhere. Latest page of the Batman Strip, I'm out of lead time on this and now it's a case of doing it before it publishes next Wednesday, wish me luck. Thought you might like to see my pencil roughs for the latest BATMAN strip-- I work pretty loosely as I'm going, preferring to add the details in the inking stage. Last year I did a design for Friendly Comics in Bellingham for my good buddy Ernie to use on his bags. He gave me free reign and I decided to do a version of Mars Magno 2.0 which I'm re-envisioning as a kid friendly adventure strip to help them learn not to be afraid of things. The only thing he asked for was Krypto the Super Dog as part of the illustration. A few days ago they asked for a higher res image that they could use for other things and when I opened the file I realized it was intentionally a bit crude because it was designed to be seen small. A larger image required some cleanup and some elements redrawn so I ended up doing the whole thing over again while still keeping the original spirit of the first one. Above is the new clean version, swing by Friendly Comics to see what the old one looked like! Or at least we have the dragon. My local church asked if I would do a quick sketch for their website to advertise a large scale art project Veronica and I are going to do with the kids in the parish. Since this was a volunteer assignment, I opted to do the piece "live" during an online class I'm running. That way the students in the class could see the step by step process and I could accomplish the piece without pay. First step is the pencils, they didn't ask for step by step approvals so this was just for me. It's easier to figure out the piece if I have a solid pencil drawing first. This took a few revisions, initially I had the whole dragon sitting on all four, but he looked a little too much like a dog so doing this cropped version seemed more interesting. Step Two is to "ink" the piece. I'm doing this whole thing digitally in Photoshop using layers and a brush tool. The inking gives it a finished look and something to base the colors on top of. Veronica had suggested I do it as a sort of silkscreen look with "no blacks" so I'll take care of that in the process. Step Three I add in a simple layer of gray for shadow-- reasoning that the flame is casting light I have that shadow up on his back. I'm trying to not make him too frightening so I opt to hold the shadows off the top of the head and face. Step Four is to add scales to the Dragon. I do this by creating ONE scale in Photoshop and then copying and duplicating it until I create rows, the whole process takes about five minutes to make enough scales to cover the dragon where I want his scales. I drop them on top of the ink drawing and change the layer style to MULTIPLY which allows me to see through it to the ink drawing of the dragon. I use the ERASER tool to remove the scales where I don't want them. Step Five is to color the piece. Working in Photoshop I drop the colors on top of the ink drawing and change the color to multiply. I also reduce the opacity of the colors so that they aren't crazy bright, bringing them down to a more subtle hue. Step Six-- Remember Veronica's suggestion of no blacks-- well here it is in action. I drop a layer of blue over the whole image and then adjust the layer style using diffuse so that the blue replaces the black on the dragon. I left the black around the flame to make it pop. And there you have it!